Plagiarism – (noun) – an act or instance of using or closely imitating the language and thoughts of another author without authorization and the representation of that author’s work as one’s own, as by not crediting the original author. I have been reflecting on the research process for my middle school students since the start of the school year and how it has evolved since doing my undergraduate degree almost twenty years ago. After Christmas break, my students will be conducting their own research projects and I always fear that I will have some students plagiarize the research they will be doing. A fear I am sure other educators have as well. Yes, it’s true, plagiarism is usually one of the very first items that are addressed in the research process. Students please document your resources! It seems no matter what steps we take educators are always going to have a few students who just don’t want to take on the responsibility of completing the research process and will spend more time to go out and grab someone else’s work to claim as their own. Furthermore, students still have difficulty understanding that Google is not the source where they go their information. I think I have said this at least a dozen times this year. I don’t want my students having any misconceptions about the research process. I want them to know up front that researching can be difficult and time consuming. It takes perseverance and dedication to the topic or subject they are researching. To tell my students researching is easy would be misleading and push them more in the direction of “copy and paste”. Which leads me to the question, are students being pushed more and more to plagiarize their work? I am not necessarily referring to teachers. Students have millions, perhaps billions of pages of internet resources to go through. You add checking the validity of the information and students feel overwhelmed. Today’s students want information given to them in quick and short bursts because that is how they receive most of their information today. Asking students to sit down and read informational text for hours is becoming more and more challenging. With the way students are receiving information today, a research article that is five pages could be difficult for them to process and reflect upon for their research. 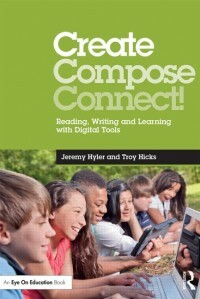 Students aren’t just suppose to read, they are supposed to think about what is being said. Multiply it by six to twelve resources that are needed and I feel students are going to start thinking about what they can do to take the easy way out. By no means am I condoning plagiarism or saying that teachers are to blame. I am simply wondering if students are pushed or feel more compelled to take the chance of using someone else’s ideas because they are overwhelmed with the research process that worked twenty-five years ago. 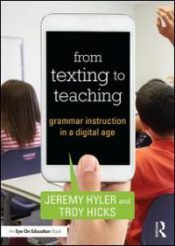 I think it is definitely worthy of thinking about more and perhaps reading professional text such as Research Writing Rewired: Lessons that Ground Students’ Digital Writing by my colleagues Dawn Reed and Troy Hicks. Also, Wacky We-Search Reports: Face the Facts with Fun by Barry Lane is a great professional read. I am open to any comments on this topic. I do feel it is worthy of a professional conversation. Happy Holidays!